If you look at a ski map of Les Trois Vallées (3 Valleys of France)- the largest ski domaine you see in the middle of the map Meribel, which is known as the heart of Les Trois Vallées. This could be a great resort where to base yourself if you want to ski all over the three valleys. But maybe you should look a bit lower, at 600 meters, it is an easy way to get to, and is connected to all the rest of the three valleys. I am talking about Brides – les – Bains. 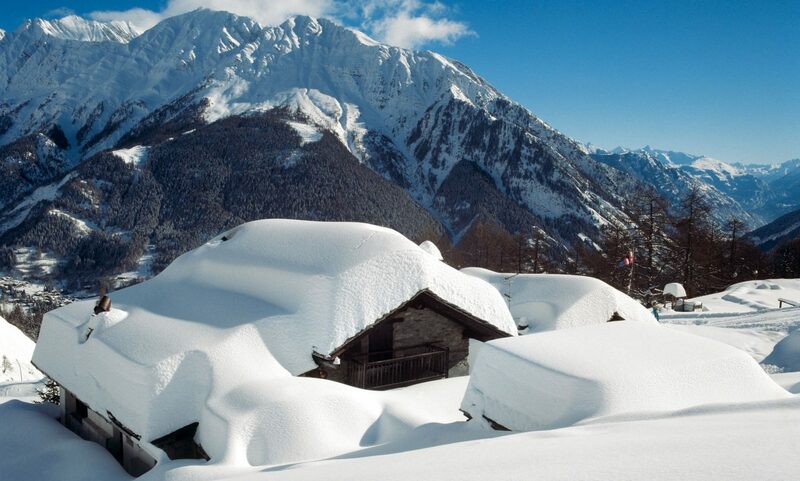 Sauna cabin at Meribel- Photo courtesy of Brides-les-Bains Tourism Office. Maybe not thought as much as a place to stay, but Brides -les -Bains is a town that is opened 11 months of an year, instead of only some months in winter and a couple in summer. Therefore, this makes a bigger population of all-year residents, and prices are much cheaper. They do not need to make in three months their year’s earnings. Rates are between 30 to 50% lower than at the high-altitude resorts in the Three Valleys. And within a 20-minute gondola ride up the mountain, you are in Meribel, the centre of the trois vallées, with 200 lifts and 600 km of slopes. Brides-les-Bains is a leading spa resort because it has precious thermal waters that have proven circulation-stimulating properties. From this March the 2,100 m2 of the Grand Spa Thermal is adding a 600 sq meters extension, comprising an aqua-fun area, a 25m swimming lane and a 30 sq m pool for aqua fitness activities. Pool at the new Grand Spa Thermal at Brides Les Bains opening later in March. Photo by Brides-les-Bains Tourism Office. Also the Mercure Grand Hôtel des Thermes **** refurbished its Cinq Mondes spa 2 years ago. For 15 euros you can access the relaxation area, bathed in natural light, with steam room, sauna, Jacuzzi and heated (indoor) swimming pool. You can also enjoy facials, body treatments, massages and manicures, giving you chance to relax and unwind off the slopes. Accessing Brides les Bains is pretty easy. Via plane you have four airports within the 2 hours range to get there: Chambery Airport = 1 h 15′; Lyon Airport: 1h40′, Geneva Airport: 2 hours and Grenoble Airport 2 hours. Coming by train, Moutiers station is 8′-10′ away (6 km); Albertville train station is 35′ away and Chambery TGB train station is one hour away. There are three bus transfers a day from Moutiers to Brides. Brides-les-Bains offer two 4-star hotels and eight 3-star hotels, all with their own atmosphere and services. The rooms are designed for those on long-stay health and slimming breaks, and are much more spacious than normal. Piste at Brides-les-Bains-Les-Trois-Vallées domain. Photo courtesy of Brides-les-Bains Tourism Office. The village feel in Brides is lovely, very good for families. You can do everything on foot, the hotels are very good and there is history in this town that was an Olympic village during the Albertville Olympics. The Olympe gondola was built to transport the athletes from Brides to the top of the mountains during the Games. Brides is also the home of the only casino in the Tarentaise region- it gets very lively after skiing and offers Savoyard cuisine at the Hélantis lounge bar restaurant. If you want, you can keep the night going visiting the Blue Night basement nightclub. Sledging run at Brides-les-Bains. Photo courtesy by Brides-les-Bains Tourism Office. The Altis*** wine cellar is THE secret spot in Brides-les-Bains. Situated in the hotel basement, this valuted stone cellar was restored and fitted out in 2014 by the Chedal family. It’s the perfect place to taste fine wines selected by former ski champion Manu Chedal and Philippe Gauthier, a friend of the family who was awarded the title of Best Sommelier in France in 1985 and 86. You can also enjoy a tasty Alpine cheese such as a Beaufort, as well as tapas. Book in advance for pre-dinner drinks, parties with friends, birthdays and other events. Close-up of the centre-ville of Brides-les-Bains. Photo courtesy of Brides-les-Bains Tourism Office. If planning to go to an European ski resort, you can check the lift passes rates here. Here is a packing list to consider when going skiing with the family. Featured image: The village of Brides-les-Bains- Photo Brides-les-Bains Tourism Office.